Birthday Wishes for Stepdad: Stepfathers are often misunderstood and considered to be indifferent. But every stepdad is not the same. If you consider your stepdad to be much like your own father, shower your love and affection on him just like you would on your own dad. Surprise him by sending a bunch of flowers anonymously on his birthday, leaving him confused and curious. Follow it up with a cute greeting card. Revealing your identity like this is sure to make his heart melt. Leave an email or a beautiful quote on Facebook to let him know that you are thinking of him. If you are not too close to your stepfather, a sweet wish could be the perfect way to break the ice and reconcile differences of the past. 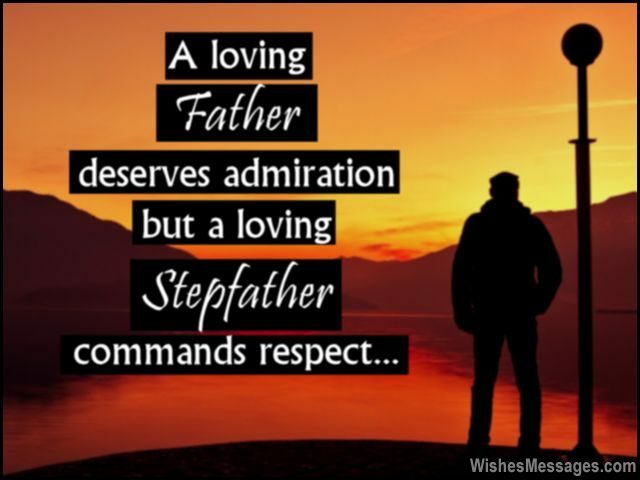 1) A loving father deserves admiration, but a loving stepfather commands respect. Happy birthday. 2) You are not just my second dad, but the second chance in life to be happy. Happy birthday. 3) I believe everything my mother says, except the fact that you’re my stepdad. Happy birthday. 4) The difference between a real father and you, is like the difference between a fake and a real diamond – invisible to the naked eye. Happy birthday. 5) I never knew mom’s divorce would be a disguised boon and I’d get an awesome stepfather like you so soon. Happy birthday. 6) Math says if A equals B and B equals C, A equals C. In the same way, if I love mom and if she loves you, I love you too. Happy birthday. 7) It’s unfortunate that the word stepfather has a negative connotation, because it is stepfathers like you who make life a celebration. Happy birthday. 8) From an OUTSIDER to a STEPFATHER to the PILLAR of the family, our relationship has come a long way. Happy birthday. 9) Even though I don’t carry your genes, every vein of body carries immense respect and love for you. Happy birthday dear stepdad. 10) The intricate relationship between a stepdad and a stepchild is understood by very few, because everyone doesn’t have a stepfather as amazing as you. Happy birthday. 11) You my Replacement Father – not because you are my second dad but because you’ve replaced the sorrow in my life with happiness. Happy birthday. 12) No matter where my dad is, he’d be very happy to see, what an awesome replacement of him, my life has given me. Happy birthday. 13) Stepfathers step on the dreams of their stepchildren over their own kids. But you did everything to come a step closer to me and make me your own child. Happy birthday stepdad. 14) I have never looked at you as my stepfather. I have always looked at you as my step to happiness, joy and love. Happy birthday dad. 15) Are you sure you are my stepfather? The way you’ve loved me makes me think that there’s some mistake. Happy birthday. 16) I wonder what I would do, without a stepfather like you. For you haven’t even once, made me daddy’s absence. Happy birthday. 17) My first step will be a sweet hug. My second step will be a cute kiss. My third step will be to give you a lovely birthday gift and my fourth step will be to wish for all your dreams come true. Happy birthday to my dearest stepdad. 18) You are my second father, but you are second to none. You are my hero, always my number one. Happy birthday. 19) By handling my stubbornness all these years, you have proved that you have more patience, maturity and understanding than any real father could ever have. Happy birthday. 20) All biological fathers of the world would be put to shame on seeing a stepdad as wonderful as you. Happy birthday. 21) You may not be my real father, but your love is more than real. Happy birthday. 22) We are not related by blood but our relationship is thicker, warmer and more loving than any blood relation in the whole world. Happy birthday. 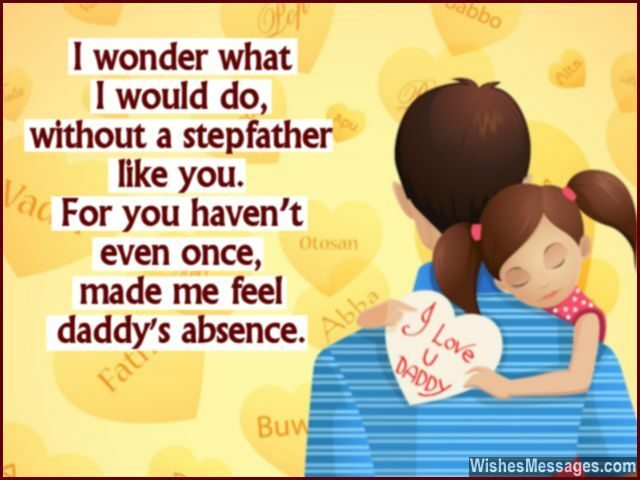 23) If all stepfathers in the world were as caring and devoted like you, the value of real fathers would drop drastically. Happy birthday stepdad. 24) You are like the foundation as well as the finish touch to our family – without either of these, we’d be incomplete. Happy birthday. 25) I don’t feel blessed because I had a chance to take birth on this planet, but because I had the chance to be raised be you. Happy birthday. 26) If I didn’t know that you are not my real father, I would’ve never believed that you are my stepdad. Happy birthday dad. 27) Half of you represents my dad and the other half represents my best friend. Happy birthday to my half father. 28) You gave me the best gift of my life by becoming an amazing second father. Let me return the favor by being your loving stepson. Happy birthday dad. 29) For most people, the words father and stepfather are antonyms. But for me, they are synonyms – all thanks to a caring stepfather like you. Happy birthday. 30) Happy birthday to the stepfather who took many careful steps to be like my real father. Happy birthday. 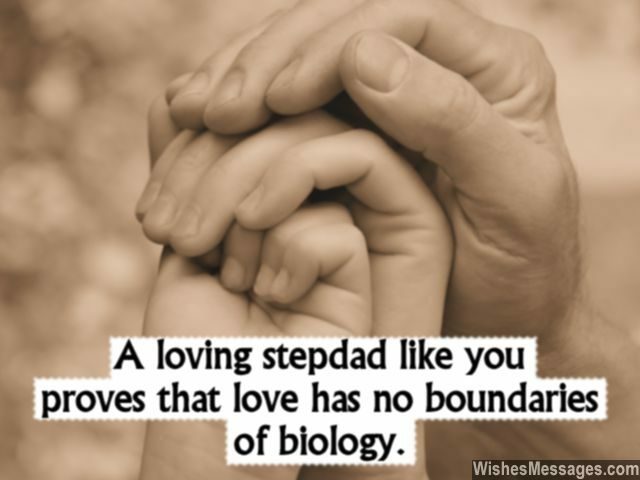 31) A loving stepdad like you proves that love has no boundaries of biology. Happy birthday. 32) I don’t call you dad out of formality, but out of the love I feel for you so deeply. Happy birthday to dad. 33) Mugs that say World’s Greatest Dad or shirts that read Best Father Ever, are of no use for a man who has already proved his worth by loving his stepchildren like his own. Happy birthday. 34) You became a father even when you didn’t have to, that is the reason I respect and love you. Happy birthday. 35) You are not my real father, nor a father figure to me. You are simply the best dad I could ever have. Happy birthday. 36) Being around my STEPdad has been the first STEP towards a happier life. Happy birthday daddy. 37) There is nothing step about the way you’ve been a dad to me. Happy birthday dad. 38) You have raised the bar for all the biological fathers of the world. Happy birthday. 39) Now that there is no bitterness in between us, let’s not use the word step in our relationship and cause any more fuss. Happy birthday dad. 40) The way you came into our lives is the ultimate proof of the fact that even the darkest clouds have a silver lining. Happy birthday.